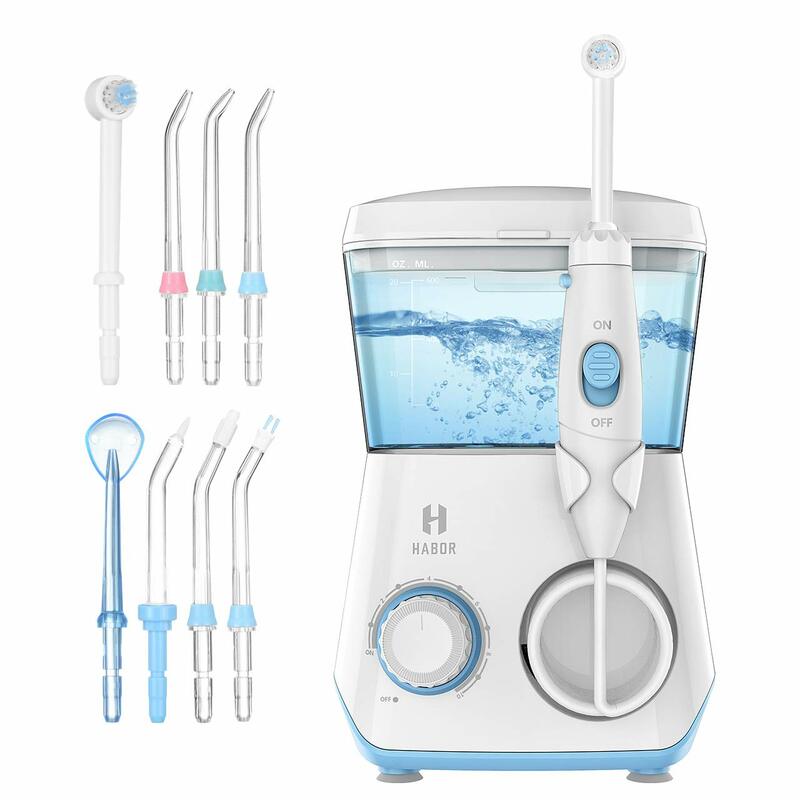 600ML QUIET ORAL IRRIGATOR: Features with 600ml large capacity, Habor water flosser supports 90 seconds of uninterrupted dental flossing, do not need to add water during flossing,perfect for achieving your healthiest and brightest smile. Designed with Noise Reduction, below 75 decibels give you a better sense of use. MULTIPLE FLOSSER TIPS: Comes with 8 interchangeable tips, Habor oral irrigator is designed to tackle the individual needs of your entire family for a remarkably deep clean between teeth and gums.It includes 3 classic Jet tips, 1 orthodontic tip, 1 dental plaque tip, 1 periodontal tip, 1 tongue cleaner. NOTES: Compared with other flosser, Habor provides a Toothbrush Tip to combine the benefits of brushing with water flossing. 10 ADJUSTABLE WATER PRESSURE: With an easy-to-turn knob, this flosser has strong water pressure with pulses at the range of 1250 to 1700 times per minute, which can be adjusted between 25-120 PSI based on your unique teeth and gum sensitivity. With 3-minute intelligent timer, the electric water flosser will stop automatically after 3 minuts to avoid overusing and overheating. ON/OFF SWITCH ON THE HANDLE: Designed with a Water On/Off switch on the handle, the dental water flosser is easier to control water flow. The handle can be rotated up to a full 360°, gives you maneuverability when flossing in and around crowns, dental implants, bridges, braces, and retainers. SPACE-SAVING: Conveniently store Habor tips in the cover slots of the units.It’s a good choice of oral hygiene and tooth care for anyone with braces, implants, crowns, or periodontal pockets. Habor provides 18 months warranty terms, any questions, please feel free to contact our customer service.